I’ve spoken before about my mother being a great cook and shared her recipe for low carb meatballs last year. Her delicious meals and passion for cooking sparked my own interest in cooking. Since mom can’t cook anymore I’ll make her this simple Italian cake to celebrate Easter when we visit. 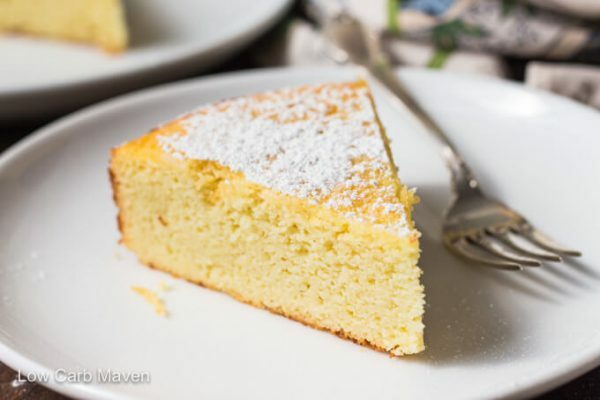 Lemon ricotta cake is a rich and delicious Italian dessert. It’s simple to make, often boasting a cheesecake-like or pudding-like texture in the middle. 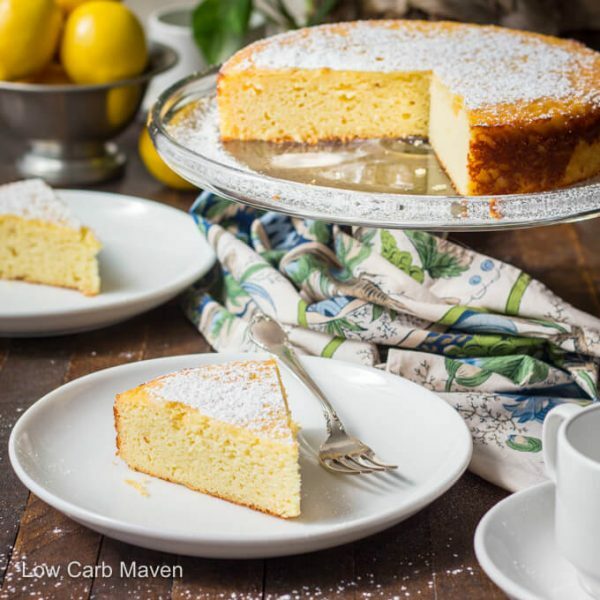 Two traditional ingredients for lemon ricotta cake are ricotta cheese and ground almonds, both of which are perfect for low carb baking. My version of lemon ricotta cake does not have a pudding-like consistency, but it is a nice moist cake. Adding a little coconut flour to the almond flour helps achieve a fluffier texture and crumb, but oat fiber, whey protein powder, or more almond flour can be subbed instead. Keep in mind that the texture will differ from the original recipe when using subs. What I like about this recipe is that it can be made with or without leavening making it appropriate for Easter or Passover. To make without leavening, simply separate the eggs, whip the whites to soft peaks and fold them into the batter. An extra egg is necessary for this technique to be successful. This beautifully simple cake is best served with a sifting of powdered sweetener, a spoonful of blueberry sauce, a lemon glaze, or a dollop of whipped cream. 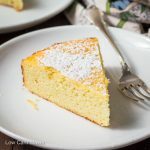 Lemon ricotta cake is best served at room temperature and since it’s not overly sweet it’s appropriate for breakfast, a snack (tea), or dessert. 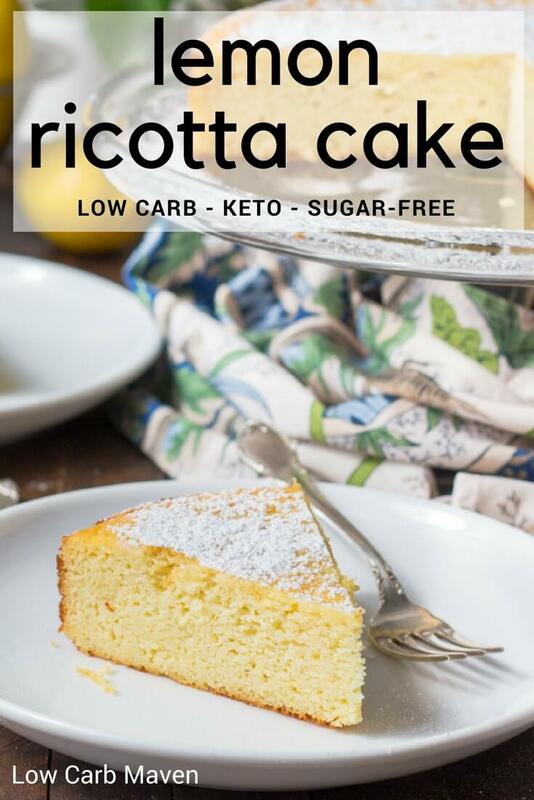 Lemon Ricotta Cake is 3.5 net carbs per serving. Lemon Ricotta Cake is an easy Italian cake made from ricotta cheese and almonds. This gluten-free flourless cake can be made with or without leavening. This sugar-free recipe is perfect for low carb and keto diets. Pre-heat oven to 325 degrees F. Cut a piece of parchment to fit the inside bottom of an 8 x 2 inch round pan. Spray or butter the pan and add the parchment. Measure the dry ingredients into a small bowl and whisk to remove any lumps. Cream the butter, vanilla, and sweetener until completely blended. Add one egg and beat until light and fluffy. Add the ricotta cheese, lemon zest, lemon juice, beating until throughly combined. Working by thirds, mix 1/3 of the dry ingredients into the batter. Add and egg an mix. Repeat with the remaining ingredients finishing with the last egg. Gently spread the batter into the prepared cake pan with an offset spatula. Bake for 50 minutes or until a toothpick inserted in the middle of the cake comes out clean. Remove the cake from the oven and let the cake cool for 15-20 minutes, then run a knife around the pan to loosen the cake. Flip out onto a rack to cool completely. Wrap any leftover cake in cling film and leave out on the counter for 3 days (unless it's hot and humid) or refrigerate. Warm slightly before enjoying if refrigerated. Serves 9 at 3.5 net carbs per serving. See post for topping ideas. Separate 4 eggs, putting the whites into a medium bowl to be whipped to soft peaks. Whip the whites to soft peaks. Cream the butter, vanilla, and sweetener. Add the egg yolks and beat until light and fluffy. Beat in the ricotta cheese, then the whole egg, lemon zest, and lemon juice. Add the dry ingredients, mixing until combined. Working by thirds, fold the whipped egg whites into the cake batter. The batter will be thick. Gently spread the batter into the prepared pan with an offset spatula. Bake for 50 minutes or until a toothpick inserted in the middle of the cake comes out clean. Remove the cake from the oven and let the cake cool for 15-20 minutes, then run a knife around the pan to loosen the cake. Flip out onto a rack to cool completely. Serve. Serves 9 at 3.5 net carbs per serving. See post for topping ideas. Wrap any leftover cake in cling film and keep out on the counter for 3 days (unless it's hot and humid) or refrigerate. If you refrigerate, warm slightly before enjoying if refrigerated. * You can sub 3 tbsp of oat fiber (or whey protein isolate) for the coconut flour or use 1/3-1/2 cup more almond flour as a sub. Using subs never achieves the same result or texture as using the original ingredients stated in the recipe. I always use cold eggs and liquids in my baked goods. The erythritol makes things cold as it melts, so I don't bother having the ingredients sit out on the counter. The exception is butter and cream cheese. I soften in the microwave just before beginning a recipe. Hi Kim, I absolutely have to thank you for this recipe! I doubled the lemon zest, added a touch of lemon extract, and used a high-quality dessert ricotta. My Italian dad said it was much like a cake his mother, my nonna, used to make. He was very pleased with it. Thank you so much for helping us rekindle some memories and experience a low-carb taste of our heritage! With so many rave reviews you hardly need one more…..but hey, who doesn’t like to hear their recipes are fabulous. Made this for a special dinner and rave reviews all around, even from the non-low carbers. Some thought it had a texture like chiffon cake. Lovely lovely recipe. Thanks for another winner Kim. Had this at a birthday party and was blown away. Made it tonight but into 12 cupcakes and so good!!! Baked them 350 for 20 mins followed everything else. Macros change to 2 net carbs per “muffin”. This Lemon Rocotta cake is super-duper moist and delicious! I added 1/2 tsp of lemon extract to the wet mixture and topped the cake with a lemon glaze (Lakanto powdered sugar and lemon)! Thank you, we absolutely love it! Btw I used white Lakanto sugar. Absolutely loved this dessert, was a little apprehensive about a dessert made with ricotta but I was blown away with the texture and how moist it was. I love desserts but not too sweet. If you are like me, give this a try. Thank you so much for sharing with us. I followed the recipe and found the Lemon flavor very delicate and the cake not sweet enough. Next time I would use Agave or Natural sugar, reduce the salt and add more grated lemon rind. Thank you for this recipe! It is a keeper. Hi … I’m in Australia and only have granulated stevia. Will this work? Well I tried it with the stevia same amounts and it has turned out beautiful! I love it and so did my family. 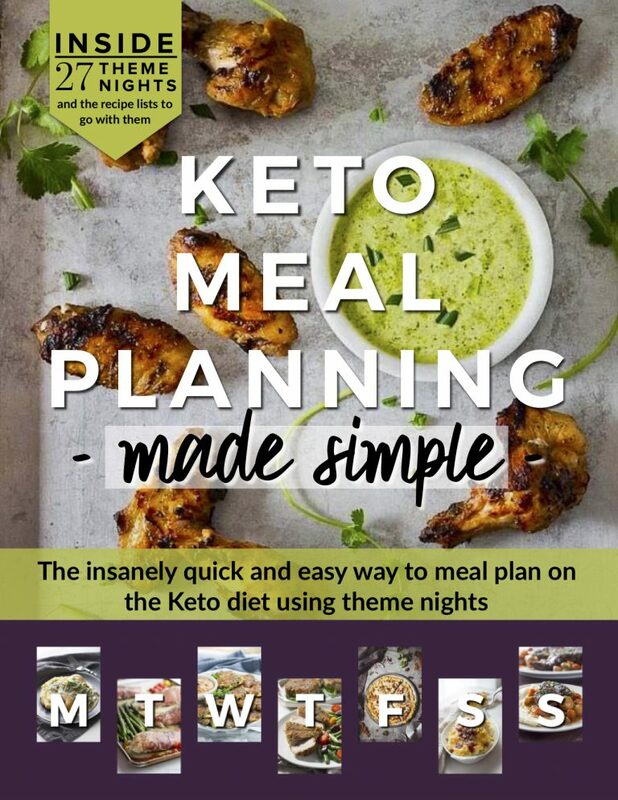 Thank you for a fantastic healthy low carb recipe. In just put this cake in the oven and am super excited…However i messed a step and am hoping it won’t mess it up too bad. I added the four eggs one at a time. But I did this in the cream mixture. How bad is that? This looks great. But I am wondering if I use coconut sugar, do I use the same amount? I don’t use things that fake the sugar as it is bad for the hormones. I use either coconut sugar, maple syrup or raw honey. I would also like to add some blueberries. Have you tried that with this recipe? If so, does adding them make this soggy? Kim, my entire family loves this cake! I’m thinking about trying different flavors. I’m guessing other citrus would work…have you tried any other variations? Thanks so much for testing and sharing your recipes. Thanks Kim. You have more exotic flavor thoughts than me! I originally thought about orange, and then have considered coconut and maybe apple caramel (using extracts). We’ll see how brave I get with experimenting! I don’t have coconut flour, so can I just use almond flour for the whole recipe? Also, I see the extra egg you referenced above, if not using baking powder. Thank you. Hi there. I’m looking to make this tomorrow in the version without baking powder.. Step #2 mentions separating the 4 eggs. Whites bet beaten till fluffy,. Step # 3 mentions creaming the yolks then adding a whole egg! That makes 5 eggs? Please clarify. Thanks! Does this cake freeze well ???? I made this recipe today not subbing any ingredients, and I used baking powder. It rose about half the size of your picture. I hope it will taste the same. Is it possible to use regular granulated sugar instead of a sugar substitute? Hi Kim, I want to make this recipe today but all I have is powdered xylitol. How much powdered sweetener would I use in this case? Thanks for this awesome recipe! This cake is dangerously fantastic! I made it for the first time last night. It’s already halfway gone and I live alone! The only thing I changed was I added additional lemon juice and lemon zest. It is very moist and has a poundcake like density to it, which I love. Next time I make it I’m going to make two and layer them with a lemon cream cheese filling/ frosting.. This is definitely a keeper. I will be making this alot. Do you think the pre mixed gluten free flour would work? 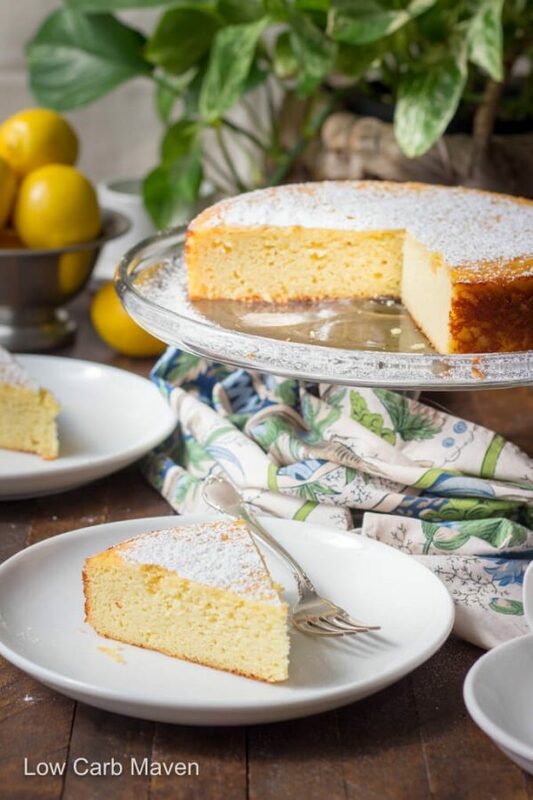 Any chance you have a Mug version of this ricotta lemon cake. I actually have all the ingredients but I don’t want to use 1C of my expensive hard to come by almond flour for cake for one person (me). Any help/suggestions you can give would be appreciated. By the way, I have made 15 different choc mug cakes from other people’s recipes and some I had to spit out! Your receipt is FABULOUS! thank you so much. my Keto diet is so skimpy but now I have a yummy thing to look forward to each day.!!! So then I signed up for your newsletter. A nut allergy so I used all coconut flour (2/3 cup) . My surprise the texture greatly improved. I made the lemon cheesecake and it was delicious. I shared it with non-keto friends and they loved it too. I am making it again to take to a party today. Craving it. I decided to put a keto friendly strawberry sauce over it. I just made this and it is light, moist and tasty! Great texture. I actually baked it in a pie dish and it came out great. Don’t forget the parchment and let it completely cool down! This looks like a ratio,,, do you mean 1/2 cup Sukrin (to=or) 1 Cup swerve? or should I use 1/2 cup swerve ? I love this recipe!!! It comes out great! First two times I used a ricotta I made and this last time I used a store bought. All of them tasted good but I did notice the store bought was a wetter dough. I think I drain my homemade ricotta more! But either way so so good. I live your recipes ! Every single one I’ve tried has been delicious !! Hi Kim…the cake looks delish. Can this be made using homemade ricotta? The online recipes I found are similar in method for homemade Paneer…the Indian cottage cheese. I live in hot equatorial region and we only get imported cheese. Ricotta works out particularly expensive. Thanks. Oh my God! Soooooo good!!!! Just made it! Thank you so much for this recipe. Made this today and I have to say it’s the best sugar-free, low-carb dessert I have ever made or tasted! Thanks so much for posting this recipe! Will definitely be making this again! I’m dying to make it right this minute… Only I have sour cream, creme fraiche, cream cheese and cottage cheese in my fridge – of course no ricotta!!! Any chance any of these could be substituted for the ricotta? Looks fab. We started low carb about a month ago. My husband loves lemon so I’m going to make this cake for Father’s Day this weekend. Looking forward to it! Do we really have to wait 3 days lol. I guess this will be my very last time even considering baking with coconut/almond flour. batter. OMG. frustrated and disappointed. 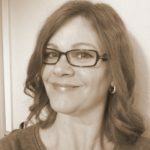 Before measuring almond flour, coconut flour, or oat fiber for any recipe…. make sure to mix with a whisk to break-up any lumps. Lumps are compacted ingredients. If you are using cocoa powder make sure to sift before measuring or you will end up using much more than an ingredient calls for. When measuring dry baking ingredients, dip and scoop the ingredient (without compacting it) and scrape the top level. Shaking the measuring cup back and forth to level compacts the ingredient causing one to use more than what a recipe calls for. All ovens cook differently. I have a full size gas oven. The times I share are what works for my oven. Someone who has a smaller wall oven may need to adjust baking time since the walls are closer to the item being cooked. The rule of thumb I like to use when trying a new recipe is to set the timer 10 minutes early to check the progress of the recipe. This way I don’t end up with a dry finished product. Cooling a low carb baked good completely with a clean tea towel draped over it will trap in steam to keep it more moist. Sometimes is does cause a little falling in the middle, but it does help to keep it moist. As for combining almond flour and coconut flour… Combining these two ingredients makes for a nice fluffy cake. The coconut flour allows for more eggs and liquid to be added to the overall recipe yielding in a bigger cake. I also like adding a little protein powder to almond flour/coconut flour. It helps provide some structure to the baked good. Often times I use all almond flour or all coconut flour to achieve a special texture. Do you think I could use part skim ricotta? I want to make this for my birthday cake and it’s all I got. Great recipe, thanks. Was well received. I tried two variations of this recipe, the original following instructions as stated but with 1/3 cup erythritol and a second batch where I whipped the egg whites first and used 1/2 cup erythritol (but just 4 eggs and kept the baking powder). I also reduced the cooking time on the second batch to about 40mins. The texture of the second version was superior. The first one was sweet enough though, so I will probably use just 1/3 cup erythritol with my whipped whites next time. And I think I will try increasing the lemon juice and zest for more zing. Hi, Can I substitute the sukrin with powder stivia? I absolutely loved this cake! It was so delicious. I read the instructions wrong and added all the eggs at once (beating them into the creamed sugar, one at a time) and it still turned out amazing. It’s a great treat! Can this be made into cupcakes? I rarely comment on blogs, but I have to compliment you on this recipe! 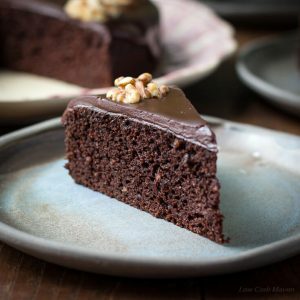 I’ve made hundreds of low-carb desserts and I have to say- I told my husband the other day this is the best one I’ve ever made! It is absolutely amazing. I had leftover ricotta and was trying to figure out what to do with it. I’m so glad I found your blog!! Hi Kim – I adore your gorgeous cake ! 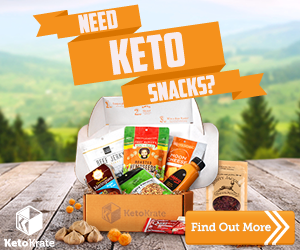 I’ve been Keto for 8 months and have reversed type 2 diabetes and lost a large amount of weight along the way. I have done a huge amount of baking in my Keto journey because I looove cake. Your recipe tops them all. Decadent, moist, full of lemon flavor it simply is divine ! Not just a hit with me but with everyone that is lucky enough for me to share it with !! I can count this in my macros and have anytime of day, it simply, without doubt is my favorite all time treat. Thank you !!! You have made my journey so much easier. I dont have to miss out on my beloved cake. Could I substitute the Sukrin with coconut sugar? And what about the butter – how could I substitute it with coconut or other oil? Can I use a 9×9 square baking pan instead? i dont have a round one and would the bake time be less due to the bigger pan size? Thanks! Hi Kim! I just had a go at these today with a slightly different approach- I had to split the final batter (without sugar) into two and added in brown sugar in one and erythritol in the other (my mum absolutely detests alternative sugars!) and the difference in the final outcome was astonishing. Admittedly, I was disappointed in mine as it came out tasteless and sandy on the tongue.,, but to my surprise, mum loved hers! I snuck a bite and my, was it divine! Light and moist with a delicate hint of lemon. Something about the sweetness just enhanced all the flavours and texture. I suspect I wasn’t liberal enough with the erythritol, but now I’m wondering if its more the chemical reaction of erythritol vs sugar that made the difference. Great recipe nonetheless, atleast half the cake was a success! My husband made the lemon ricotta cake for my birthday! It was so, so wonderful and i thank you for your post of this very delicate and creamy cake. We will continue to bake this recipe over and over. 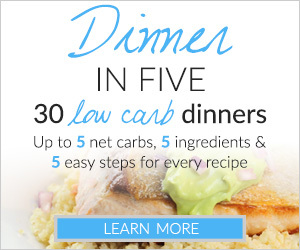 I am relatively new to low carb life style since January and I have really enjoyed the diet and the recipes. However, the sugar free baking has been challenging to say the least as I frequently find the sweetness to be artificial. This cake is authentic with bright lemon flavor and a creamy buttery texture. Thank you again! Oh my gosh, Kim! This cake is absolutely delicious!!! I used the THM sweetener mix and topped it with the “Fancier” Blueberry topping. I don’t have stevia glycerite so just used my liquid Trader Joes stevia. This will definitely be a regular when a fancy treat is in order! I will be making this tonight! I would like to fill it with homemade whipped cream and strawberries so should I double the recipe and bake to cake rounds or will it be thick enough to cut in half and fill it? I will be baking it tonight and filling it tomorrow morning should I leave it at room temperature or refrigerat it overnight? Hi Nick. Great questions. One recipe baked in an 8-inch round will yield a cake with a thickness around 1 1/2 inches. A layer cake with one recipe will be have thinner cake layers, but can still look dramatic with an inch thick layer of whipped cream and strawberries. Take a look at this chocolate cake filled with strawberries. It is about 1/4 inch thicker than this ricotta cake, but looks nice with the whipped cream and strawberries on top. It’s a nice looking homemade cake. Of course, you can double the recipe and have two thick layers, or double the recipe and bake in three pans for a tall three layer cake. It’s up to you and depends on how many people you are serving. This cake can also be cooked in an 8-inch square pan and be cut into squares to be split and served like strawberry shortcake. 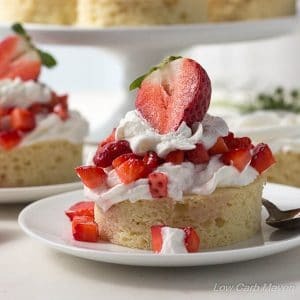 I am making this tonight and filling it with homemade whipped cream and strawberries, will I have to double the recipe and make to separate cakes so I can make 2 layers or will it be thick enough to make one cake and cut it in half to fill it? I want to make this but I am so scared about the swerve taste. When I use the granular swerve I get a horrid aftertaste. I have wasted so many ingredients trying again and again. Do you think the confectioners would be better or is there another sweeter you would suggest that is not full of chemicals? Lovely recipe. What is considered a serving size? Thanks! Can this lemon ricotta cake be frozen? What can I substitute for Sukrin? Can I use Splenda or Equal? Also can skim ricotta be used? Thanks! I am going to try out this recipe and hopefully use it for my wedding:) I only have stevia and xylitol…Can I use one or both of these? Thanks! This was delicious! It’s the first lo-carb dessert we’ve made that tasted like a regular cake. I used the leavening. Thank you so much for the recipe! I used half Splenda – half Swerve (because sometimes 100% Swerve has too much of a cooling effect for me) and I used your lemon glaze made with powdered Swerve. Yum! We will be making this often. This lemon ricotta cake has become a real favorite at our house. So versatile! I made it with leavening and followed the recipe exactly. Next time I might do it with orange or lime but use a little more zest. Perfect dessert to serve with whipped cream!! Tres chic! This is a lovely cake. I didn’t have an 8-inch pan, so I used a 9-inch and it was fine, just a bit thinner. We topped with homemade whipped cream, toasted almonds, and raspberries. I wish I could attach a pic for you. It looked so pretty. I toasted the almonds in the oven while the cake was baking. Just get your sliced almonds and toss with some erythritol and a tablespoon or 2 of water, mixing every once in a while. They toast up really nicely and make a yummy topping. I usually make them to throw in some plain greek yogurt with chopped blackberries for a little crunchy deliciousness. Ps, I love Chris’s idea of trying with orange next time and also your idea of a jam swirl. if one were to use regular granulated sugar, how much would you recommend? Oh wow, this is SUCH a lovely cake! Given that my partner is addicted to citrus flavours (as I am to dark chocolate), I had to give this one a go, and this turned out beautifully. The only thing I changed was to use erythritol plus monk fruit sweetener, as that’s all I had on hand. I used the baking powder method and had no problems at all, the cake turned out fantastically moist, soft, and perfectly flavoured. We ate this with a dollop of full fat Greek yogurt and some homemade low carb berry compote, and the combination is divine. Thank you so much for yet another great recipe! Just so I’m clear – it’s 3 eggs for the regular recipe, and 4 eggs for the recipe without baking powder? I can only consume sheet/goat dairy, and although I have, in the past, found goat ricotta, it’s hard to come by. Do you think I could simply use goat (cream) cheese in place of the ricotta here? I’m thinking maybe 3/4 or even 1/2 cup goat cheese and 1/4 cup or 1/2 cup, respectively of water to lighted it up since ricotta is quite light in texture)? THANKS! Can you clarify the sweetener? Is it 1/2 cup Sukrin or 1 cup Swerve/Lakanto? Or is it 1/2 cup Sukrin and 1 cup Swerve/Lakanto? Sorry. I’m still confused on this. If using Swerve or Lakanto do you use 1/2 c or 1 cup? Thank you. I have used a few of your recipes now and they all come out great. This cake is lovely. I don’t miss a thing when I eat this. If I never had another cake made with wheat flour and sugar I could have this one and be happy. I cant wait to try even more of your recipes. I made this cake last week, and it is moist and delicious, with a beautiful yellow color. I have had it for dessert with whipped cream and berries and for breakfast with a dollop of Greek yogurt. Lovely and simple recipe. Thanks, Kim. This cake is delicious! First low carb desert that actually tastes great. I doubled the ricotta cheese and cooked it 55 min and it turned out fantastic. Thank you for this great recipe. I just made this delicious cake!! I love it!! Is so moist and tasty!! Thank you for sharing! This was a fabulous cake! Kind of a cross between a pound cake and a cheesecake. I served it yesterday to my Italian family for Sunday Dinner yesterday. None of these folks are low-carb, sugar-free people (just me). So I didn’t tell anyone and just hoped for the best. They all raved about it and wanted to know what it was! I was really happy, until I wasn’t…..they ate it all! I was hoping to have it for breakfast today :(. Even my super-picky carb-lov’n, sugar-eating 100% Italian husband was like “that cake you made was really good!”……what the what, I couldn’t believe my ears. So thank you Kim and thanks to your sweet mom. Tell her, her recipes live on even if she is unable to cook them these days. I really like this. Mine turned out a little dry. What can I do differently to moisten some? I like the protein prospect! Thanks for sharing. Hi Julie. I’m sorry your cake is dry. All ovens are different so maybe cook it a little less next time. I do have some good tricks and ideas to prevent dryness and/or what to do with a dry cake: 1. Add 2 tbsp of oil to the batter if the recipe seems to produce a dry cake. 2. When the cake is done cooking lay a clean tea towel over the cake until it has cooled. 3. When completely cool, freeze completely then let thaw in the fridge. (I don’t know why this works but it does.) 4. Slice the cake horizontally and fill with custard (pastry cream), lemon curd or whipped cream. 5. Spoon mascerated berries over the top. 6. Serve with lemon curd, a “hard sauce”, or a raspberry or blueberry sauce. 6. Tear or cube the cake and make a trifle. OMG, made this today, just tried a piece OMG, this is bakery and fine restaurant quality! Did I say OMG? LOL, this cake is awesome, light and airy. I’ve already started thinking about blackberries, and blueberries. Could you check the butter amount? I’m making it now and I am confused! Half of a stick would be 4 oz, right. Thanks! I just replied….. You must have posted at the same time! I just realized I’m thinking tablespoons?! I’m babysitting a grandchild and I can barely think it all LOL Thanks for your prompt reply I have it in the oven now. Smells delicious! Could you please tell me how much whey protein to add? Still not seeing the macros…. Made this recipe for the first time yesterday. I didn’t have the almond flour or sugar substitute so used Tigernut flour and coconut sugar. Turned out beautifully and so can be eaten by AIP (Anti Immune Protocol) diet followers too! Sounds delicious. I am going to make it this weekend. What are the macros on this other than 3.5 net carbs? I still don’t see the nutrition on this. It’s a great recipe. Please share if you would. The cake sounds sooo good but I have family that has allergies to nuts. Is it possible to use coconut flour rather then almond flour in this recipe?